A new exhibition at the Devil’s Porridge Museum to commemorate 100 years since the Armistice. Above: a poem from an autograph book in the Museum’s collection dates December 11th, 1918. Our new displays explore the Armistice and its aftermath locally and nationally. On November 11th 1918, the guns fell silent and the First World War finally came to an end. Having completed their huge task of national importance, the munition workers at His Majesty’s Factory Gretna downed their tools and celebrated: a brass band paraded through the towns of Gretna and Eastriggs; the foreman gave a rousing speech; the munitions girls demanded a dance which 400 people attended that evening; bunting was everywhere…the War was over! It was a wonderful day but in the weeks and months to come that elation turned to doubt and worry as the future of largest munitions factory in the world remained uncertain. On one day in December 1918, an estimated 4-5000 people were made unemployed. The factory workers had come from all corners of the earth to achieve victory for Britain and now they would scatter again. Above: a dance was held on the evening of November 11th which 400 people attended. 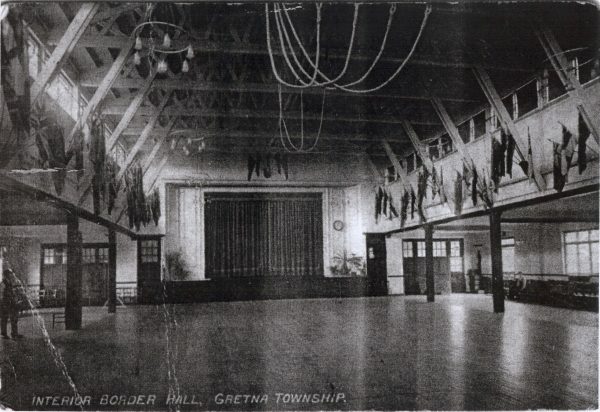 The dance halls had been closed due to the Spanish flu but the Gretna girls repeatedly called for a dance and they eventually got their way. The fascinating story of Armistice Day at H.M.F. Gretna, the thoughts and feelings of the workforce and the immediate aftermath of the peace for the people of this area is told in a new exhibition at the Devil’s Porridge Museum, Eastriggs. Chairman of the Museum Trust, Richard Brodie reflected, “The exhibition is a tribute to the 30,000 people who lived and worked in Gretna and Eastriggs and turned the tide of the War in Britain’s favour. Although most were here for less than three years, their experiences would figure large in their memory for the rest of their lives. Before they left, they recorded their tributes in two fascinating Souvenir Magazines and wrote their notes of friendship in autograph books. Copies of these fascinating documents can be viewed by visitors.